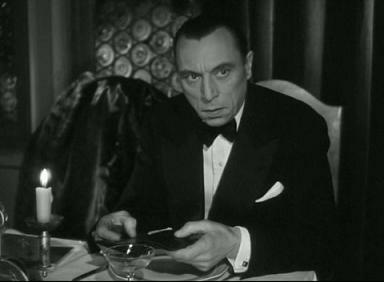 Henri Decoin's second film in quick succession with Louis Jouvet opens with an extended sequence apparently designed to convince the audience that a plot centered on doppelgänger resemblances is not inherently implausible. That such effort is expended before the film proper even begins isn't a good sign, although there are certain meta-cinematic pleasures to be had given that the sequence uses Jouvet's own appearance in the earlier Copie conforme to aid in the argument. One of the points of that film, of course, was that a certain amount of work is needed for the resemblance to truly hold up to scrutiny, whereas here Jouvet's character -- a policeman with an uncanny resemblance to a criminal -- takes advantage of his appearance with barely a whit of preparation, and no idea whether, for instance, he sounds like the other man. Sure enough, someone realizes pretty soon that the cop is not who he seems, though the film makes this even more implausible because no-one else in the man's inner circle draws the same conclusion (though henchman Robert Arnoux, who delivers a very droll performance, observes at one stage that he has the strange sensation of watching a dubbed film while in the presence of his "boss"-- an amusing overlap with the dialogue in the prior Decoin-Jouvet film, where the latter's character observes that a dubbed film is a film that has lost half its sense). Unlike in Copie conforme, Jouvet isn't really called upon to play two roles here, barely modulating his regular attitudes, which in turn seem copied rather blatantly in some respects from the cop he played in Clouzot's far richer Quai des Orfèvres. 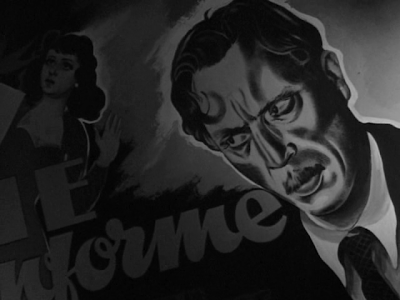 There are occasional moments when the film soars, however -- Decoin handles an early murder sequence with great flair, taking advantage of the unusual tunnel location near the Porte des Ternes as a man blithely walks to his death.